I'm not a movie critic. I'm a Mom who happens to be a Christian so this review is from that perspective. This the first time we have gone with all four kids to the movies and the first movie in the theatre that Luke (newly 3) and Caroline (newly adopted) have ever seen. We went and saw The Good Dinosaur. 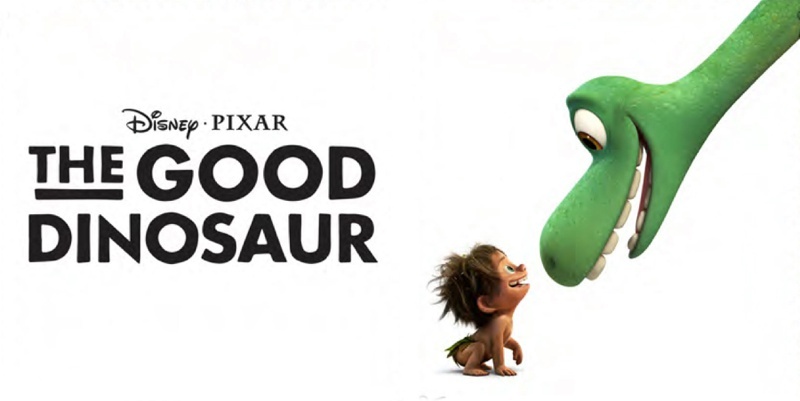 I had read no reviews and only knew from commercials that there was a green dinosaur and a toddler kid roaming around and getting into prehistoric trouble. What I didn't know was that there was a movie short called Sanjay's Super Team that showed before the movie. It was cute and entertaining. 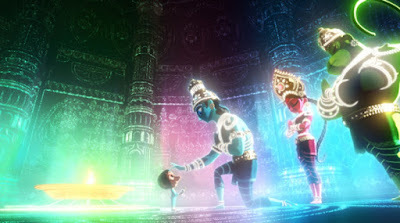 The kid comes around to the Dad's point of view that the Hindu gods are awesome when he sees them as super heroes. I could tell a few seats down our 7 year old knew something wasn't right when they started praying to the statues in the box. 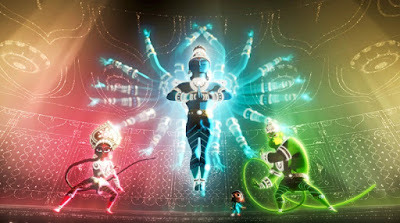 But I'm sure our 5 year old boy would have thought these are 3 great new super heros to believe in with each their own color and power to defeat the evil forces that were attacking Sanjay. I write this so that parents can be aware and have thoughtful discussions with your children. Our questions looked like the following: Did you notice them praying? Who were they praying to? Why? Are they real or pretend gods? Do the statues really have power? Are superheros (spiderman, hulk, superman) real? For our family we have talked about the Christian God and other pretend gods like Baal and the Golden Calf before as well as the story of Daniel and praying to anyone besides the one true God so they had some basic understanding when we brought up the conversation of praying to statues/gods. 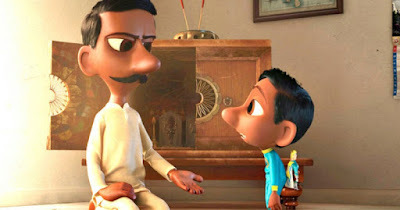 I'm not saying Christian kids shouldn't see this short film but that a good conversation afterwards would be encouraged. It is an attractive, fun, introduction to another religion that a LOT of people on this earth believe to be truth. For us and hopefully a lot of Christian parents it will be a great conversation starter with their kids that different people have different beliefs and when they grow up they will get to decide what they truly believe to be the TRUTH. I would rather our kids have this conversation with us instead of with friends in college after hearing it from a professor or a kid down the hall. 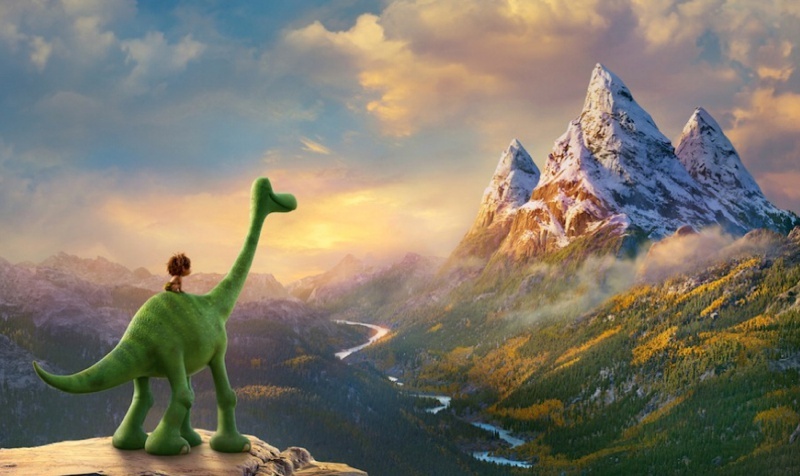 The actual movie The Good Dinosaur we enjoyed. And maybe because we were taken aback to see the short film first we had a deeper thought process with this movie than we otherwise would have. It was a cute reversed movie where the dinosaurs were more human like and the human was more pet dog like. But out of this film we were able to talk about several concepts. Is it good to be alone? Why is it better to have a friend on your journey through life? Even though you might be different than another you can share pain and difficulties and be encouraging to each other. Taking care of the least of these... there is a scene that alludes to adoption. That family is important and can help you "stand". There is also a big point being made about "making your mark". 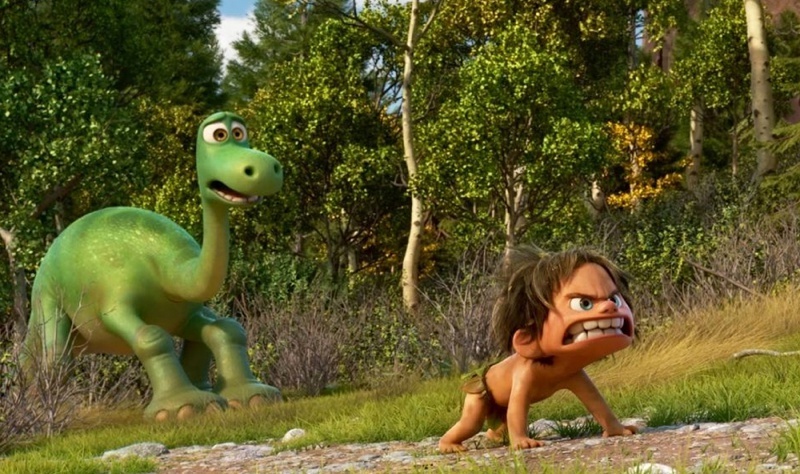 And although Arlo survived a long adventure overcoming fear and one would think that is how he "made his mark". I would say he "made is mark" by forgiving (enemies and people who have hurt you), loving the unlovable, thinking of others first and sacrificing his life for that of his friend. This is how you "make a mark" that can lead to a change in our lives and in the lives of others.